NEW YORK -- The 15th annual Citizenship NOW! hotline a free, confidential citizenship and immigration information service helping thousands of callers is now open! "Citizenship Now! is the most comprehensive university-based immigration legal service program in the country," Chancellor James B. Milliken said. "It's an important reminder to all that at CUNY, immigrants matter." In anticipation of a record number of calls due to the current political climate, the hotline has expanded to 80 phone lines from last year's 48. It will be open June 19 through Jun. 23, 10 am to 8 pm and staffed by more than 400 volunteers. Calls will be answered in English and Spanish, as well as Mandarin, Cantonese, Russian, Korean, Italian, Haitian Creole, Bengali, Polish, French, Yiddish and Arabic. Permanent residents who want to become U.S. citizens or those seeking permanent residency or who have other immigration concerns will be referred to organizations that can help with applications at low or no cost. "The outpouring of volunteer support for this year's call-in from community activists, attorneys, students and others is inspiring," attorney Allan Wernick, Director of Citizenship Now! and a law professor at Baruch College said. Wernick also writes the "Immigration" column for the Daily News. "We will provide the information and referrals needed by immigrants to naturalize and for other immigration goals," Wernick added. "For undocumented immigrants, the best defense to deportation is getting legal status and we are here to help." 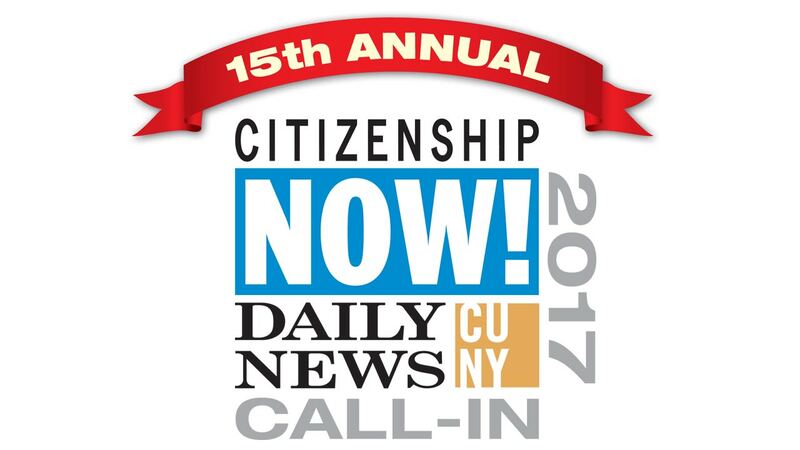 Citizenship NOW!, the largest program of its kind in the nation, was co-launched by the Daily News and CUNY in April 2004 to address the lack of access to free and confidential immigration information. More than 156,000 callers have sought information from the hotline since its opening. Call-in numbers for Citizenship NOW!